Examples, solutions, videos, worksheets, and activities to help Algebra 1 students learn how to find the domain and range of functions. 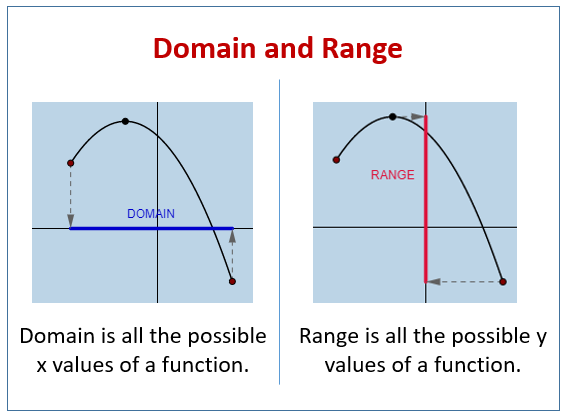 The following diagrams show the domain and range of a function. Scroll down the page for more examples and solutions. How to find the domain and range? This video provides two examples of how to determine the domain and range of a function given as a graph. Finding the domain and range of a function is as simple as finding the possible X and Y values, respectively. Learn about X and Y values as dependent and independent variables. 1. No zero in the denominator of a fraction. 2. No negative numbers under square roots after simplifying.